This easy gluten free apple cider donuts recipe is the cure for what ails you when you go to the apple orchard—but can’t buy their sweet-smelling baked goods! Every fall, we go apple picking. And every fall, the smell of apple cider donuts hangs in the air and has the power to make my gluten free son and me downright miserable. So we do the only thing that makes any sense at all: bring our own gluten free apple cider donuts. And pick up some more apple cider while we’re at the orchard, so we can make more donuts when we get home! For a whole batch of these baked apple cider donuts, you only need 6 fluid ounces of cider. Of course, you can use apple juice if you don’t have cider. When I first posted this recipe in 2012, you can see from the comments that some readers had trouble getting the cinnamon sugar topping to stick to the donuts. I find that the easiest way to get the topping to stick is to toss the donuts in the cinnamon sugar when they’re still hot enough from the oven that you can barely touch them. If that’s just not comfortable for you, remember to press the donut in the cinnamon sugar mixture on all sides rather firmly when the donuts are as warm as possible. I tend to flip them over multiple times in the topping mixture until they’re well-covered, and then not handle them again until they’re completely cooled. If you forget to work quickly after baking, or you’re just not able to work with the donuts while they’re hot, you can brush the donuts very lightly with melted butter before pressing them into the cinnamon sugar. Some sugar syrup would also work. All baking pans and tins are generally not created equal. They vary in size, shape, color, and material. Those differences affect baking in plenty of ways. But most of the differences aren’t that significant, and you as the cook are usually able to sense for what sort of adjustments you need to make for your particular pans. Donut pans vary in all of the same ways, but their shape is even more significant. If you’re making a fried donut, you’re not using a pan to shape them. But if you’re making baked donuts like these apple cider donuts, they take on the shape of the pan itself. For properly shaped donuts, you want your pan to have a prominent raised center that reaches nearly as high as the sides of the donut. Otherwise, as the donuts rise in the oven, the hole will close on top, leaving only a divot underneath. To combat a donut pan that has a short raised center, you can still preserve a donut-with-a-hole shape. Just fill each well about 2/3 of the way, or about as high as the center is raised. My favorite donut pans for baked donuts are these 6-cavity nonstick donut pans by Wilton (affiliate link—feel free to shop around!). It’s the pan you see in the photos. It has the perfect shape and size, and even though it’s somewhat dark in color, it doesn’t bake the donuts too quickly (which dark pans have a tedency to do). Dairy-free: The only dairy in these gluten free apple cider donuts is from the unsalted butter. It can most likely be easily replaced with Earth Balance buttery sticks, although I haven’t tried that. Earth Balance tends to be rather salty, though, so I’d eliminate the salt as an ingredient in the donuts, though. Egg-free: There are two eggs in this recipe, and they are responsible for a lot of the structure and texture of these soft, tender donuts. You can try replacing them each with a “chia egg” (1 tablespoon ground white chia seeds + 1 tablespoon lukewarm water, mixed and allowed to gel). I’m afraid I just don’t know how they’ll turn out, though. Sugar: If you’d like to try to make these donuts with a sugar alternative, you can try replacing the granulated sugar with Swerve brand granulated sugar replacement or Lankato monkfruit granulated sweetener. Pay attention to the texture and viscosity of the batter, though, as those alternative sweeteners tend to absorb a lot of moisture. You may need to add some more cider. Apple cider: If you can’t find apple cider, you can make these donuts with apple juice. There is, however, a difference between the two. Technically, apple cider is raw apple juice that hasn’t been filtered to remove pulp (source). For the donuts in the photos and video in this post, I used cold pressed spiced apple cider from the refrigerated section at Trader Joe’s. In the past, I’ve made them with raw apple cider from the orchard, and also with plain apple juice. 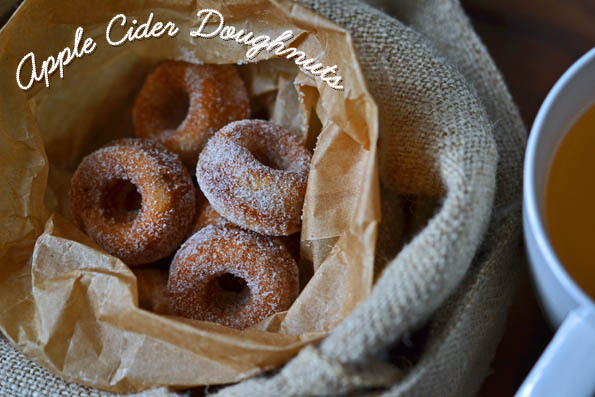 The more flavorful and aromatic the cider, the more so the donuts. And remember, if you can’t bring a batch of these donuts with you to the orchard, you can make them fresh as soon as you get home. Preheat your oven to 325°F. Grease a standard donut pan and set it aside. See the post for a discussion of donut pans. In a large bowl, place the flour, xanthan gum, baking powder, baking soda, salt, cream of tartar, 1 teaspoon ground cinnamon, nutmeg, and 3/4 cup granulated sugar, and whisk to combine well. Create a well in the center of the flour mixture, and add the butter, eggs, and cider, and mix to combine. The batter will be very soft. Transfer the batter to a piping bag fitted with a plain tip or to a squeeze bottle. Squeeze the batter into the prepared doughnut wells until they are each about 3/4 of the way full. Shake the pan back and forth horizontally until the batter is in an even layer in each well. Place in the center of the preheated oven and bake until the tops of the donuts spring back when pressed gently (about 12 minutes). The underside will be browned, but the tops will still be relatively pale. Remove the pan from the oven and allow the donuts to cool for about 3 minutes, or until they are no longer too hot to touch. While the donuts cool slightly, place the cinnamon sugar topping ingredients into a small bowl. Gently remove the slightly cooled (but still warm) donuts from the doughnut pan with your fingertips and turn them around in the cinnamon sugar until they are well-coated on all sides. Place the finished donuts on a clean sheet of parchment paper. Serve immediately, or at least within a day or two stored uncovered at room temperature. Freeze any remaining leftovers in a sealed, freezer-safe container. Originally published on the blog in 2012. Images mostly new, video new, recipe tweaked only slightly. I made these with Cup4Cup. I’m still trying to figure out baking and cooking gluten free. I felt like they were too dense which a frequent issue I have been running into. Do you sift the flour? Unless I specifically specify sifting the flour (which is rare), you don’t need to sift. My guess is that you are overmeasuring your flour if you’re measuring by volume, not weight. I highly recommend measuring by weight with a very simple and inexpensive digital kitchen scale. So excited to try these. How important is the cream of tartar? Is there any way to sub it for something else? Hi, Sara, the cream of tartar helps to activate the baking soda in the recipe to provide more lift. You can try replacing it with lemon juice. Hope that helps! I made this tonight with flax eggs, coconut oil and coconut sugar and it came out so beautifully and so delicious. Thank you for the recipe, even though I had to make some substitutions to make it vegan. It was delicious. Thanks for letting us know that your substitutions worked, Brittany! So glad you enjoyed them. So excited to try the recipe. I moved from Massachusetts many years ago and lament the loss of apple cider donuts every fall. Now that I’m GF I’m baking up a storm so thanks for having this! Ordering the pans now. Aw, Nicole, I feel your pain! So glad you can bring that back. You have some amazing recipes in here and i would love to read more articles, but your website is crowded with ads, it’s jittery and it’s difficult to navigate. Thanks for the recipes though, I hope you can figure out your configuration. There are actually only a few ad slots on my blog, Valentina, and the ads all load after the content (it’s called “lazy loading”) so they don’t interfere with the content-viewing at all. My configuration is fine. The ads are essential to my continuing to provide nearly 1000 recipes for free. Oh Nicole I made these last night and they were delicious! Even my husband who is not GF and VERY fussy, said “MMMMMmmmmmm!!!!!”. One thing I found was that the sugar/cinnamon wouldn’t stick very well. I even took them right of the pan with some and rolled them thru it and it wouldn’t stick. Then I tried brushing with a bit of veg. oil and then rolling them and still no luck. Am I doing something wrong? I made these tonight to keep me distracted from the election news. I did some minor substitutions (I know!) using King Arthur GF Flour (I know, you don’t like it) & dairy-free butter replacement. Perhaps because I used KA flour, the batter was less runny and more thick, so I spooned them in instead of piping them. I made them in a full-sized doughnut pan & miniature muffin tins, and baked them about 10 minutes. Instead of cinnamon sugar I mixed up sugar & pumpkin pie spice. They came out COMPLETELY AMAZING. I might have a new favorite doughnut, which is hard for me, I was completely in love with the cinnamon doughnuts you posted on Living Without, but these come out so light and cakey, it’s like a whole new game. Thanks for this recipe so much. I just made these with the help of my kids. We used a mini muffin pan and I substituted tapioca starch for the corn starch. I cooked them a bit longer because I still haven’t gotten that silly oven thermometer and i know that it runs low. I put the cinnamon sugar in a baggie and tossed to coat the donuts a few at a time. My son called them cinnamon muffins but i could tell the “donuttyness” of them. It only came out to 2 WeightWatchers points per donut/muffin which is right up my alley. Thanks for the recipe! I wonder if you are the same GClark who left one of the very first reviews on the new cookbook on Amazon? I was so grateful to read that you are enjoying the new book, and that you really “get it.” I cried a little (relief!) but don’t tell anyone. ;) Thank you for taking the time to write a review. It really helps! I also used tapioca starch instead of corn starch and swapped apple pie spice for the nutmeg. Delish. I just made these in a mini square shape like brownie bites. Very light and everyone loved them. I made the first batch in a pan for 6 large donuts, and they were kind of cakey and spongy, but done all the way through at 10 minutes. The smaller bites are less flimsy and easier to eat. One year ago today, on the day before Halloween, I decided, “Hmmm, I think I’ll try this recipe for apple cider donuts that I’ve never made before so the adults have something to munch on when we come home from trick or treating.” I was so excited about them, and they were a huge FLOP!! And this was back before I was diagnosed with celiac disease, so they contained all purpose flour in all its gluten-y glory. YOUR recipe, on the other hand, looks awesome…I think you’ve given me the courage to try again! How cool would it be if my very first successful homemade apple cider donuts were GF? These look great! Btw, I just got my copy of your new book (this time I got a hard copy instead of the kindle). I love it!!! Trying to decide what to make first, too many great choices. I especially like that your personality comes through even more in this book – its one of the reasons I love reading your blog. I can’t wait till school gets out so I can try some of these. Thanks! Not every GF recipe I try is successful, but more often than not, Nicole hits the spot. This one was my test recipe for today. There are only 2 of us here so I halved the recipe but that’s the only change I made. And they were absolutely positively scrumptious! I didn’t have a donut pan so I have been shopping since the recipe was posted. Two stores I visited were out. Then I went to Kohl’s and with coupons and Kohl’s cash, I bought the babycakes donut maker for all of $7.24. That’s a deal I couldn’t pass up. And in my Texas kitchen, not turning on the oven is usually a good thing. I can see many wonderful donut memories made with my grandkids, Nicole’s GF donut recipes (including the chocolate donut recipe in the new book), and my new kitchen appliance. Thank you Nicole! I have been reading the new book as if it were a novel–and loving it just as much. I have to take dinner rolls to a few GF attendees at a conference in Fort Worth on Friday night and I was struggling to find the perfect recipe that will compare with what everyone else is eating at the conference. The Dinner Rolls with Yeasted Refrigerator Bread is the perfect recipe. And what’s even better is that the rolls still tasted good on the second day while most GF dinner rolls just get heavy a few hours later. These are still delicious. I have to take some other meal items on Friday and Saturday too. All of my recipes are from Nicole or the Better Batter site. I love the make or buy idea! I’m thinking pasta. I buy soooo much gluten free pasta. Thanks for all your hard work! Ugh…I was BB&B today to get a donut pan to make the chocolate donuts in my lovely new cookbook and opted for the regular pans over the mini pan set they had. Do you think these would be ok in the regular pan? These sound yummy! I’ve been looking for an excuse to buy the USA Pans donut pan! P.S. – Love your new cookbook! Even more than I love the first one! So, I’m one egg short for this recipe (talk about unprepared for the storm, I know). It’s wrong to send my husband out to the store in a hurricane, right? :) ok I’m joking but only just cause I really would love these right now! We even have cider fresh from a lovely mill upstate. Sigh. In other news, LOVE the new cookbook!! Oh boy, when I go into town wednesday i”m getting a digital scale and a mini donut pan..My husband is having a great time gaining back the 46 lost pounds.We both Thank You and are enjoying both of your cookbooks.Now if I could just not be to tempted to try everything. Is the batter stable enough to use just one pan and then refill it when each batch is done? Some GF batters should not sit for awhile before baking. Time to go buy a donut pan! YUM! Just got your new book this AM! Can’t wait to dive in! Your new book came on Friday and as soon as I got my hands on it I sat down and read it cover to cover. You would have thought it was Christmas or my birthday! I don’t have a donut pan (yet – but it is on my Christmas list) so will sub in my mini muffin pans and make donut holes. Hi, Rebecca! Donut holes sounds perfect! Thank you so much for always being so kind and supportive. It means a lot to me! What timing! My roommate and i were just talking about our donut craving (bear claws to be exact)! Im GF and she isnt so Im sure shes gone already gone and bought one by now but I cannot stand those frozen GF donuts so I guess ill be making these. Thanks! I was just about to ask about babycakes but see someone beat me too it. :-) I assume the regular 4-6 min in babycakes for these? My diet is in BIG trouble with these. Thanks!!! I would say 3 1/2 to 4 minutes, Cynthia, in the doughnut maker. Love that thing! Got the cookbook on Saturday and have been stealing away time each day to read it AND I made my own pita bread last night for dinner!!! They were good and will get better the more I make them, I know it! There really isn’t, with any degree of accuracy, El. You can make an educated guess by doing the math (1 cup = 16 tablespoons = 140 g Better Batter) (1 tablespoon cornstarch = 8 g), but I don’t recommend it. I would just use all Better Batter (or whatever high-quality all-purpose gluten-free flour you prefer). I am so making these tonight for breakfast tomorrow, I just bought my donut pan yesterday at Bed Bath and Beyond to make the glazed chocolate donuts from your new Quick and Easy cookbook, these just look totally warm and cozy!! Is there a way to make the gluten free cake flour without using grams? I would love to make these, but I don’t have a scale. So I was shopping in the grocery store looking for some apple cider and a scale just jumped out at me! I’m so excited to try these! These look delish! I happen to have an old doughnut (donut?) maker that was my moms. It is seriously ancient but makes great doughnuts (donuts?). They are triangle shaped donuts so more could fit in the maker at one time. I will have to give these a whirl! My cookbook should arrive today. I’m so excited!!! Triangle-shaped doughnuts, Holly? That sounds like fun! Hope you enjoy the cookbook! Thanks so much for your support. It really means a whole lot to me. I am so excited about these! I have combing over my new Quick & Easy GF on a Shoestring cookbook since it arrived and I have already more pages flagged with stickies than I can count….! Now I get to add these to my list!!! Yummmy! Thanks so much.